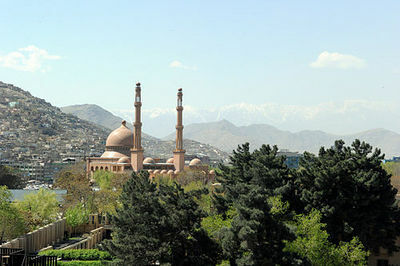 Haji Abdul Rahman Mosque, Kabul – Photograph 2010 Via Wikimedia Commons. The latest major news from the South Asian front has, as usual, been distorted by the social pathologies of a failing society; namely, Pakistan. Afghan President Hamid Karzai announced boldly on October 4 that Afghanistan had signed a strategic coordination agreement with India. He restated his candid allegations, which no honest Muslim can deny, that Islamabad supports the Taliban as well as the terrorist Haqqani network that operates in his country. As every unintimidated Muslim also admits, the roster of extremist entities subsidized by the Pakistan regime is long. It includes the Wahhabi and Deobandi groups aimed at Kashmir like Lashkar-e-Taiba, the anti-Shia mass killers such as Sipah-e-Sahaba, and the general political spectrum representing the jihadism of Mawdudi and epitomized by the Jamaat-e-Islami party. The most recent Afghan war has passed its 10 year mark, and the Pakistan-backed radical alliance has invaded Indian, Bangladeshi, British, American, and even Burmese Islam, as well as meddling in the other Muslim communities of Central Asia. While the world watched, and as I wrote in this portal, U.S. Admiral Michael G. Mullen, after his disclosures to the U.S. Senate about Pakistan and the Haqqani criminals, was undercut in public by President Barack Obama. Similarly, Karzai has already been pressured to match his denunciation of Pakistani duplicity and his new alignment toward New Delhi with pathetic pleading for help from Islamabad in dealing with the Taliban. But there will be no real assistance to the tormented people of Afghanistan from Pakistan, under the thumb of Ashfaq Parvez Kayani, the feckless Asif Ali Zardari, Inter-Services Intelligence (ISI), the fundamentalist clerics, and the corrupt landowning class. Karzai has had no choice but to elevate India to a position above that of the U.S. in his strategic arrangements. The repellent and disastrous attitude of the Pakistani regime in continuing to protest over U.S. liquidation of Osama Bin Laden under the noses of the local military may devastate – definitively this time – Islamabad's credibility in the U.S. The situation has become so grotesque that Shakeel Afridi, the Pakistani doctor who participated in the surveillance of the Bin Laden compound in Abbottabad, has been arrested by the ISI, tortured, and faces a trial with a possible death sentence for his involvement in the elimination of the man who did more to harm Islam than any other person in modern times. Pakistan refuses to hand Afridi over to the U.S. for relocation in a safe place. Pakistan also demands, in its pompous, "babu" manner, that the U.S. repatriate, courteously and solicitously, the family of Osama Bin Laden to their homelands. Pakistan used the blood of the Afghans martyred by the Russians to aggrandize itself, and now wants to use the blood of the Afghans and NATO troops killed by the Taliban for the same purpose. The aim of the Islamists in Islamabad has never been to defend Islam: it has only been to protect their own privileges. Pakistan appears to enjoy the impunity that the kingdom of Saudi Arabia possessed before September 11, 2001. But to a limited extent, impelled by the reforming energy of King Abdullah, Saudi Arabia has come to terms with the malignant effects of its financing of global Wahhabi religious colonialism. Pakistan, now the world's number-one terror-exporting state, will apparently do nothing in such a direction of repentance. Sufis, Shias, and seculars are murdered by the Taliban, Mawdudists, and other fanatics in Pakistan and the survivors wail over the victims – then lay responsibility on the U.S. for the free-handed violence of religious bigots whose penchant for bloodshed long preceded the involvement of the U.S. in South Asia. Those targeted by the terrorists form political alliances with the killers who are sharpening the knives for their necks and then whine, asking "what else can we do?" They can fight the extremists in a determined and consistent manner, and if they do not, they are doomed. Instead, they mourn their dead, are ignored or silenced, and bend their heads to the swords of the murderers. On October 9, Pakistani brigadier general (ret.) Imtiaz Ahmed delivered himself of a diatribe replete with conspiratorialist hallucinations about a supposed American plot to seize Afghanistan between the withdrawal of the Russians and the terrorist assault of September 11. Such psychotic ramblings make the Taliban themselves appear relatively sane. At least the terrorists have a fairly consistent ideology; they do not simply invent specious theories to shift responsibility away from themselves. The idea that America was most interested in subjugating or manipulating Afghanistan and Pakistan, with their infrastructural weaknesses, at a time when the former Soviet Central Asian republics – including some with considerable energy and technical assets – were open to new influence, would not do credit to a backward and illiterate peasant. Other Pakistani media accuse the U.S. and NATO of failing to secure Afghanistan, as if the difficulties in doing so were not grossly exacerbated by Pakistani obstruction. So what choice has Karzai made? And what options does he possess? If Obama will not back up Admiral Mullen, Obama will not back up Karzai. Behind all these clumsy attempts at diplomatic dancing lurks the reality – that the U.S. and NATO want out of Afghanistan. U.S. media have already primed the liberal sector of international opinion to believe in the fantasy of reconciliation with invented "moderate Taliban." Karzai himself has been showered with filth and abuse, including the ultimate American insult: portrayal as a corrupt tyrant in the increasingly-irrelevant Doonesbury comic strip. "Doonesbury lies and Afghans and NATO soldiers die." That should be the slogan of protestors against surrender to the Taliban. But in the U.S. there are no such protestors; the country is instead swept with marchers against financial policy. Western media flatter the Pakistani elite by deferring to their "fear of encirclement by India and Afghanistan." But India must fear encirclement by a nuclear-armed Pakistan allied to a nuclear-armed China. By contrast, the power of an India tied to a prostrate and ever-vulnerable Afghanistan is questionable, at best. Plots to kill Karzai will continue and may succeed. Afghanistan, lionized by the West when its Muslims fought Russian imperialism stoically, effectively ending the existence of Soviet Communism in its classic form, is now viewed with contempt as a sick, old patient beyond effective healing and without a personal support system based on family and community. If American media are blind to the realities in Pakistan, UK media lead the way in combining blindness, deafness, and silence in reporting on the moral crisis in Pakistan. In this context, Karzai has no other direction to turn than to New Delhi. 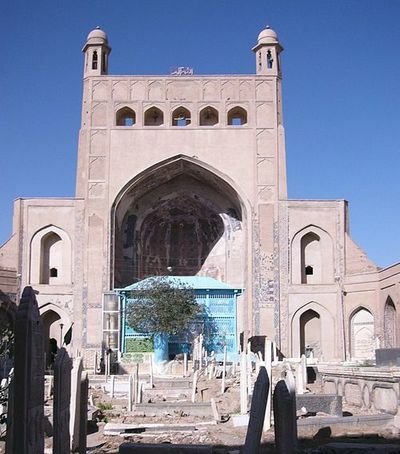 Shrine of the Sufi Abd Allah Ansari, Herat, Afghanistan, 2008 -- Photograph Via Wikimedia Commons. The success of Saudi power in fooling the West about Wahhabism for so long was explainable rationally by the dependence of the developed world on Middle East energy resources. What does Pakistan have that makes it so valuable? Not oil, but the blood of "others" – anti-radical Afghans and Pakistanis, Indians and Bangladeshis and Westerners. The demands for political reform that have shaken Iran and the Arab states have had no echo in Pakistan. Pakistan's elite does not perceive that the country has insoluble internal political and social contradictions that threaten its survival. Rather, they insist that the country has enemies that menace it from without: the U.S. and India. Totalitarian China is becoming more open and transparent as it seeks respectability in the international financial markets, but Pakistan shuns the bright light of public scrutiny from exposing its multifarious intrigues. Indeed, across the world, moderate Muslims are joining battle against radical ideology. Muslim educators and clerics in the small, Balkan Kosovo Republic have organized against the infiltration of radical Arab and Pakistani extremists in their country. In Iraqi Kurdistan, an important effort is underway to eradicate the non-Islamic practice of female genital mutilation (FGM). Somali Sufis have organized armed militias to defend themselves against fundamentalist attackers. Saudi civil society activists speak out against restrictions on women drivers and other regulations imposed by Wahhabism. Iranian Sufis continue confronting the clerical dictatorship in that country. Indian Sunnis are also mobilizing against Wahhabi aggression. In America and Europe Muslim emigrant communities and their children are working to find common understanding with their non-Muslim neighbors. It is only among Pakistanis, in their disintegrating country and abroad, that the call for social progress and intellectual rebirth in the Muslim world is blocked by the obstinate refusal of the Pakistanis to admit their own failures. As Qur'an states, "Truly, God does not change the condition of a people until they change what is in themselves." (13:11) But of the world's Muslims, the Pakistanis alone cling to their vanity, their arrogance, their adamant repudiation of responsibility to ameliorate their condition positively. Pakistanis are encouraged in their heedlessness by the indifference of the so-called "international community." But different national postures elicit similar international reactions. Pakistan expostulates against the killing of Osama Bin Laden on its territory; Yemen has reacted with much greater calm, if not enthusiasm, to U.S. action against the Al-Qaida in the Arabian Peninsula (AQAP) leaders Anwar Al-Awlaki and Samir Khan. Still, the world is as incautious about Yemen as it has been about Pakistan. Last week, the Norwegian Academy awarded three Nobel Prizes for Peace, with two designated for Liberian President Ellen Johnson Sirleaf and Liberian civic activist Leymah Gbowee, and the third to Yemeni female opposition leader Tawakkul Karman. The history of the Nobel Peace Prizes has often appeared risible, and the choice of Karman is ambiguous. Aged 32, Karman has been called the "mother of the revolution" in Yemen. She removed her face veil (niqab) and organized the protest group "Women Journalists Without Chains." But she also participates in the Al-Islah opposition party that includes the Yemeni branch of the Muslim Brotherhood (MB) and the Wahhabi followers of the sinister, henna-bearded agitator Abd Al-Majid Al-Zindani, who has been associated both with dictator Ali Abdullah Saleh and the late Osama Bin Laden. At least, however, Tawakkul Karman, who appears at first as an exemplar of the recent fusion of Arab professionals (in her case journalism) with the fundamentalism of the MB, has taken off her niqab. Regardless of where ideology drives her, she will encourage the changes taking place in neighboring Saudi Arabia. In Pakistan, by contrast, the country's leaders have kept a mask of untruth, denial, disinformation, and contempt on their people, which threatens to suffocate them. As this agony takes place, rhetoric from Islamabad against the U.S. and India will be irrelevant. Pakistan has invented something beyond the "failed state" – a "state suicide" in which the elite of the country slays the national integrity. As it does this, the consequences in Afghanistan, India, Bangladesh, the UK, America, and elsewhere, will continue to be dreadful. The passivity of the world in the face of the slow Pakistani collapse is scandalous. I have watched this morbid process for six years, most of them silenced or ignored. The Muslims must act in their own interest but must also learn from the democratizing movements taking place elsewhere and among other believers. To paraphrase the Japanese Christian social reformer Katayama Sen, writing 110 years ago, while the Muslims of Pakistan and Pakistani origin are silent, "I will speak for the dumb; I will speak for the despairing silent ones; I will interpret their stammerings; I will interpret the grumblings, murmurings, the tumults of the crowds, the complaints, the cries of people so degraded by suffering and ignorance that they have no strength to voice their wrongs. I will be the word of the people. I will be the bleeding mouth from which the gag has been snatched. I will say everything." That is the principle in which I believe and hope to instill and reinforce in all my Muslim and non-Muslim colleagues, sisters, and brothers, from Admiral Mullen and Hamid Karzai to Tawakkul Karman and the humblest Islamic devotee, from the U.S. to Kosovo to Pakistan and Yemen and beyond.